The genus Echinocactus includes about six species of barrel cacti that are native to Mexico and the southwestern United States. These are true desert plants that cannot handle any humidity or standing water to grow. The most common among these plants are almost perfectly round when juvenile so therefore make excellent display plants. They are also highly attractive, with evenly spaced rows or spines of their deeply ribbed lobes. As they grow, it's not uncommon for them to stretch out so they look more like ovals than circles. As with most cacti, the secret to their successful growth indoors is nearly perfect drainage, as opposed to letting them dry out. Light: Full sun. A barrel cactus does best in a very sunny window, perhaps a southern exposure. Plants that do not get enough sunlight will grow more slowly and fail to thrive. Water: Water infrequently and ensure that the soil drains completely. Do not leave any water sitting in the tray or allow them to sit in water. They are very prone to root rot. Soil: A cactus soil mix is ideal. If you use a regular peat-based mix, be sure to add sand or extra perlite to enhance drainage. Repot the plant when the soil begins to break down. Fertilizer: Feed with a weak liquid cactus fertilizer throughout the growing season. 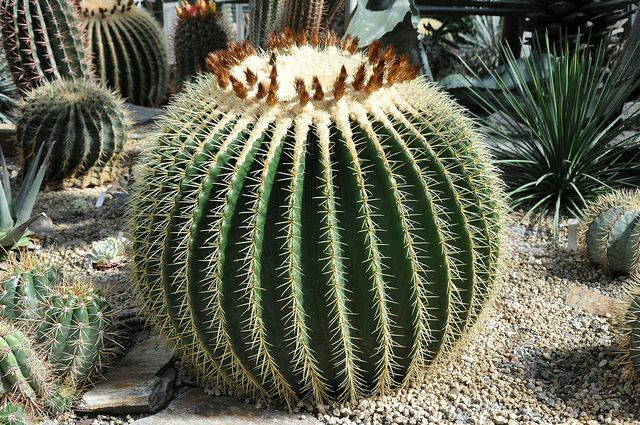 A barrel cactus is typically propagated by seed. A mature cactus will bloom in the summer with flowers that grow in whorls around the top of the plant. To seed a cactus, plant the seeds shallowly in a cactus mix and keep them warm and very slightly moist. It's best to repot at the beginning of the growing season, or in summer. To repot a cactus, make sure the soil is dry, then gently remove the pot. Knock away the old soil from the roots, making sure to remove any rotted or dead roots in the process. Treat any cuts with a fungicide. Place the plant in its new pot and backfill with potting soil, spreading the roots out as you repot. Leave the plant dry for a week or so, then begin to water lightly to reduce the risk of root rot. E. grusonii. Often called the golden barrel cactus, this is the most common of the genus. This cactus features long, straight, yellow spines that grow in profusion along the plants' ribs, giving it a yellow cast. Mature plants grow to about 3 feet in height and up to 2 feet in diameter. A spineless variety is available. E. horizonthalonius. This plant remains smaller than its cousins, usually growing no larger than about a foot in height and more than a foot in diameter. The spines of this plant are very stiff and reddish to light brown. E. platyacanthus. These plants have dozens of ribs around a 2-foot-tall barrel. They tend to grow into oblong shapes and have black spines that cover the plant incompletely. There are many different kinds of cacti that can be grown indoors, but the golden barrel cactus is quite distinguished. They are very attractive cacti for dish gardens or indoor display. A group of them is especially attractive, as they look like a collection of balls tossed on the ground. It's critical, however, to never let these cacti be exposed to prolonged periods in water or even very high humidity. They will suffer from rot in the presence of humidity. Echinocactus are vulnerable to pests including aphids, mealy bugs, scale, and white fly. If possible, identify the infestation as early as possible and treat with the least toxic option.